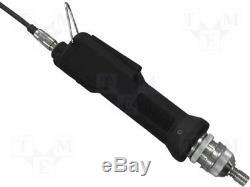 Electric screwdriver; 0.2÷1.2Nm; 1000rpm; 30VDC. Coupling turns off the motor after reaching preset tightening torque. Torque is adjusted by means of a knob with a scale and locking ring placed on the screwdriver head. Our company is involved in online trading and have wide range portfolio products, we always try to offer the best prices and service and we want that shopping with us would be easy and convenient. Our team will do everything to serve you quickly and to answer any questions you may have. We will try to do our best to keep our customers satisfied. We are dedicated to provide the best experience while shopping with us. The item "Electric screwdriver 0.2÷1.2Nm 1000rpm 30VDC 1 pcs" is in sale since Monday, November 26, 2018. This item is in the category "Business, Office & Industrial\Hand Tools\Other Hand Tools". The seller is "zigmaz_trade" and is located in Bristol.